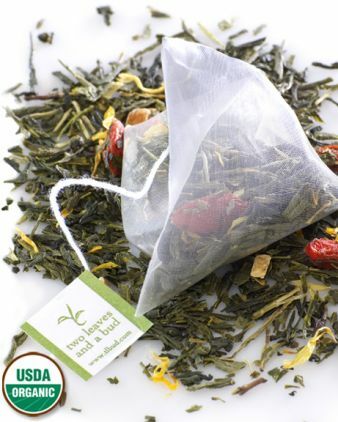 Tropical Goji Green is an organic Japanese-style green tea grown in China. We start with traditional Japanese sencha, then add organic Goji berries and natural tropical flavors to make this tea slightly tangy, but also rich and smooth. Great iced! Yes… yet again, apprehension: nervous to try this tea – needless hesitation because this tea turned out to be quite delightful. The dreaded goji berry! I need to get over my tendency to immediately assume I won’t like a tea with goji berry! Because, the truth of the matter is, that while I have come across a few that have not been to my liking, MOST of the teas that I’ve tasted with goji berry I’ve enjoyed. I guess it is because the first goji berry tea that I tried was way too sour and since that time, I’m inclined to think that all goji berry teas are going to be equally as distasteful. But… not this one! This tea is delicious. The combination of the tropical fruit flavor and the goji berry creates a unique tropical/berry flavor that is a very welcome departure from the typical tropical flavor. Not that I dislike tropical flavor – I quite like it. But sometimes it seems way too overdone. This tropical tea is deliciously different. The berry is not at all sour. Tangy, yes… but I find it more on the sweet side than tangy or tart. And smooth. There is a buttery richness from the Sencha – it is fresh and very slightly vegetal. A very pleasant tea to drink hot, but, even more enjoyable to drink iced! Very refreshing and silky smooth! I like it a lot!